Among the finalists of our Work Design Now series sponsored by Haworth is Edelman’s Toronto office. With 67 offices and more than 4,800 employees, Edelman is the largest public relations company in the world. After 60+ years in operation, the firm is itself a brand-maker. The physical space of their new Toronto office was an opportunity for Edelman to brand themselves as the place to build a long-term career in the industry. 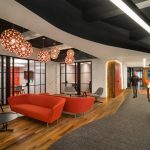 So they worked with Bartlett & Associates to deliver an integrated hospitality and workplace concept with elements appropriate to engage the agency’s increasingly young employees with local character. The new design transitioned from closed offices to a flexible, loft-style, and open floor plan to increase collaboration and teamwork through a democratic setting. The flexible space accommodates multiple uses such as town hall meetings, client receptions, staff training, lunches and breaks, and down-time. Graphics — such as powerful Nelson French Toronto landscapes — permeate the space. They create energy, dynamism, and scale while playing with perspective and defining functional neighborhoods. Collectively, the design emphasizes local branding and identity for Edelman employees. Bartlett converted an unused gravel rooftop that now serves as an inspiring, private patio. The lobby is a boutique hotel reception complete with bookshelves, a bright purple carpet, and furniture from manufacturers Arne Jacobsen and Eero Saarinen to provide a “living-room” effect. Edelman made sustainability an important component of the project from the very beginning. Throughout the Edelman office are bare concrete floors with carpet only in meeting rooms and the boardroom. Natural light and low VOC paint increase indoor ambient quality, while the majority of the materials (including furniture) are locally sourced. From top to bottom, the new Edelman office in Toronto offers an inviting and interesting client experience.